It may be sad that Gywneth Paltrow and Chris Martin are “consciously uncoupling”, but happier news is that human consumption appears to be “decoupling” from environmental impact. I’ve just returned from an optimistic and enlightening Dialogue meeting run by the Breakthrough Institute in Sausalito, California. (I know – it’s a hard life.) Winner of the event’s ‘paradigm prize’ was Rockefeller Institute environmental scientist Jesse H. Ausubel. His research shows that modern economies, like the US, have progressively lightened their diet in terms of energy, water, land and materials consumption, largely from a peak in the early 1990’s. When we look at the data, it is easy to understand the environmental klaxons of 1960’s and 1970’s. The steady state economics of Herman Daly, which still largely defines the mainstream environmental paradigm, is a response to a neo Malthusian environmentalism. It looked then as if a growing, resource-hungry population would consume far more than the world’s carrying capacity could maintain. This has been popularized through the concept of ‘one planet living’ (or ‘peak-Earthers’ in the States). However, in his essay the Liberation of the Environment, Ausubel carefully sets out the data to show a different trend emerging: trajectories that lessen pollution and conserve the environment, despite rising consumption to meet the needs of a growing population living increasingly rich, energy hungry modern lives. At the heart of ‘one planet living’ is the meme that ‘if everyone on Earth was to consume at the level that the developed world currently does, then we would need three planet Earth’s worth of resources.’ Hence, lowering environmental footprints, through reduced consumption is at the heart of mainstream environmental thinking. 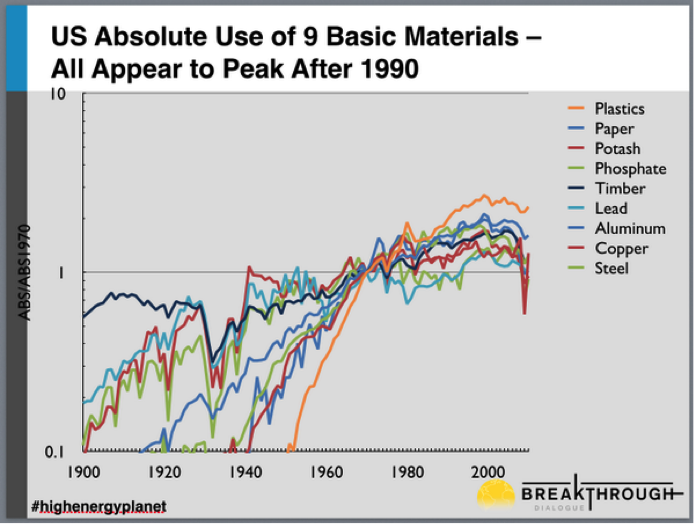 In fact, Ausubel shows that although consumption has continued to rise over the past 25 years, this trend has “decoupled” from environmental impact. The key driver here is the urge to raise economic value through increased performance efficiency, particularly noticeable in energy. So while there is a role for energy efficiency, the goal is arguably more to reduce carbon intensity than overall consumption. I found it particularly interesting that, along with projected decarbonization; food production decoupled from acreage; and more efficient water use; Ausubel also points to a trend towards dematerialization. Even plastics peaked in the 1990’s. Lower material intensity of the economy is good news for nature, enabling less waste, and the preservation of natural resources. The sad thing for the environmental movement is that Malthusian logic of an impending catastrophe may be resurrected without recalling what happened to Malthus. His fear that population would outgrow available food supply was disproven by his failure to predict technological innovation. Before long, agricultural yields per person were significantly higher. In the US, the debate continues to kick off between traditional environmentalists and pragmatic environmentalists about whether a “Good Anthropocene” is a contradiction in terms, or an aspiration. Personally, I think optimism about technology and the human future is a far more innovative, pragmatic and engaging narrative than a pessimistic perspective. It is in this that the so-called ‘new environmentalism’ differs from the old, and why technological optimism is the real force for a green future. just the basics of civilization but all the luxury items as well. Those of us that have energy can’t live without it. A sustainable and affordable energy supply is no longer enough. Nations must also strive to have an independent energy supply. Independent energy supply is when a nation is self sufficient in supplying all of it’s own energy requirements; hence it is not dependent on another country to supply its energy or its energy fuel. 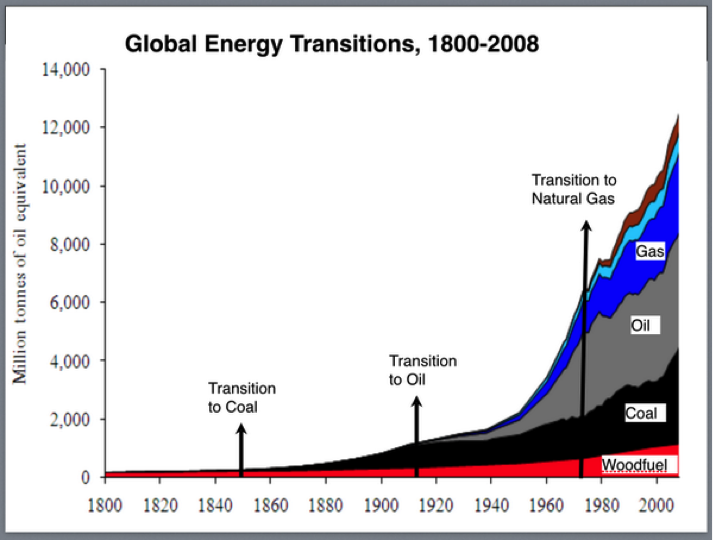 Re-articulating the energy and climate debate.